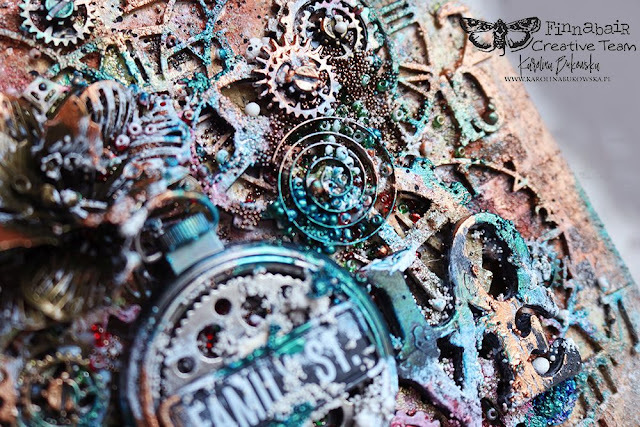 Get ready for total mixed media awesomness with this brand new art piece from Karolina! Today I'd like to show you a notebook cover that I've recently created. With spring around the corner, I feel the time of monochrome inspirations has gone for me and I'm having more and more fun playing with various colors. I started by applying White Gesso on my journal's cover (including the spine) and then I created a beautiful texture with Graphite Texture Paste and a stencil. 3D Gloss Gel helped me to fix some lovely chipboard embellishments - my first layer of decorations. I added a coat of the new Art Extravagance Rust Effect Pastes: Camouflage and Metal Rust. They are amazing! You can apply them with a sponge, a palette knife, a texture tool or an ordinary paintbrush. They are matte and opaque and I love their effect! Then I used Metallique and Sparks paints for more color - I covered all the embellishments and dried them. Unless you want to mix colors, make sure every layer of paints and media is thoroughly dry to avoid muddy mess. I also like to add a bit of a matte finish splashing some watered down Black Gesso you will see exactly how I do it in my video tutorial below. It was the first time I worked with new Finnabair's Dubbing Brushes and I must admit that they are perfect for shading, applying products and brilliant for creating textures! You really need to get your own! To enrich my project and give it a more three-dimensional effect, I added lovely Art Ingredients: Art Stones, Glass Glitter and Glass Beads. They create stunning effects and are very versatile. Different Finnabair Art Ingredients are brilliant to help you create interesting backgrounds and unusual textures and can of course serve as charming fillers for little bottles (have you seen Kasia's tags?) or different Mechanicals (like I did in this project). Endless fun! 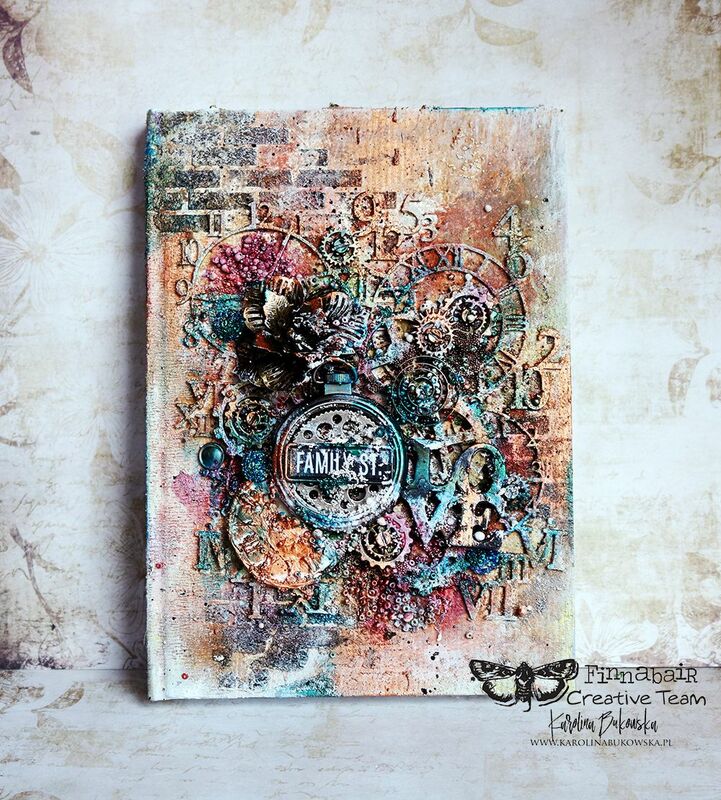 Please enjoy this video tutorial and see step by step how I altered this notebook cover. I just love altering objects and giving them a completely new life and direction. In a way, I feel I can take them into a different era and feel the nostalgy of time travel thanks to some simple tricks with paints and textures. I hope you're feeling inspired to create some of it yourselves. 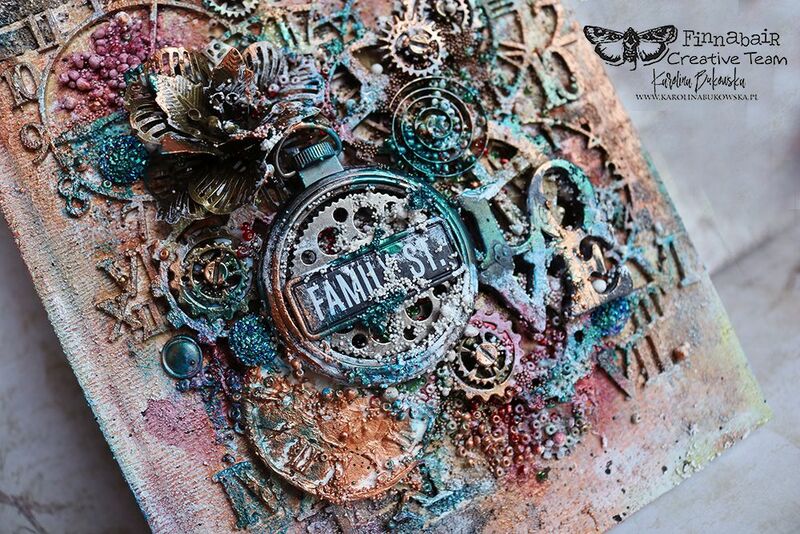 This book of time is FANTASTIC! Very inspiring. Thank you. All your work is inspirational. I love how all the embellishments come together ! Great piece ! !